Ethan and I were walking up to Starship Hospital today to visit my cousin when we happened upon a very strange turn of events, take a look….. I mean, what exceptional judgement. 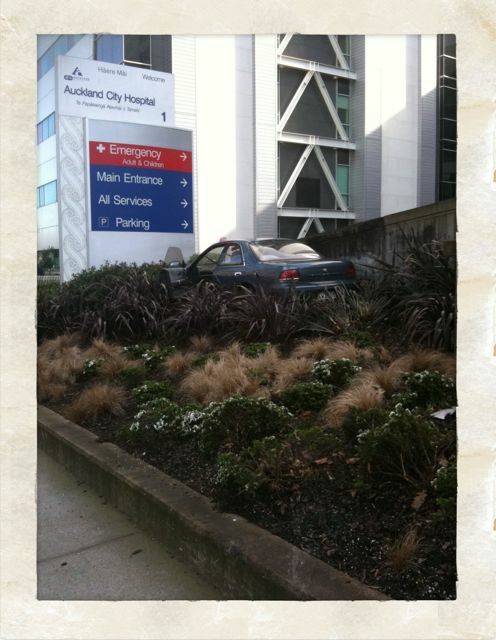 When I lose control of my car in the future I am totally going to do it in front of Auckland hospital, I mean who else gets parking like this? All jesting aside, it was a small miracle that all the suffering patients were able to limp off the wall where they were sucking down their cigarettes and get out of the way.